Girls4Tech is Mastercard’s signature education program that showcases their payments technology and engages employees as role models and mentors. This is a hands-on, inquiry-based program that connects the foundations of their business to science, technology, engineering and math (STEM) principles and shows students that it takes all kinds of interests and skills to pursue a career in STEM. The curriculum is based on global science and math standards and was created in conjunction with their top engineers and technologists. 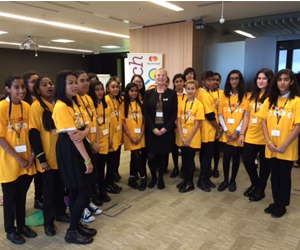 Their London launch event was held in October 2015 with over twenty 11 year old girls from Beal High School. They brought the girls through six stations showcasing algorithms, digital convergence, fraud detection, local network intelligence, cryptology and big data. While initially somewhat shy when presented with the challenges of each station, the girls quickly became very engaged and focused and they made incredible progress in solving each task. By the end of the event many of the girls said they wanted careers in one of the areas showcased and all of them had a new view of what is possible. MasterCard's President of International Markets, Ann Cairns, participated in part of the event and shared an overview of her own career and experience, having pursued her education in mathematics. One of the volunteers on the day, Elizabeth Samuels, says "the Girls4Tech events are high energy and incredibly rewarding!" Mastercard has also held events in Frankfurt and Rome, with further events planned in Belgium, Turkey, Spain, France, Poland and more. The U.S. has seen great success with the programme as has its roll out across Asia Pacific, Middle East and Latin America regions. So if you'd like to work for an organisation that actively supports gender parity in STEM, why not research the wide range of roles available at Mastercard. Make the move to MasterCard. As the world of electronic payments grows, so do they. And they want you to grow with them.